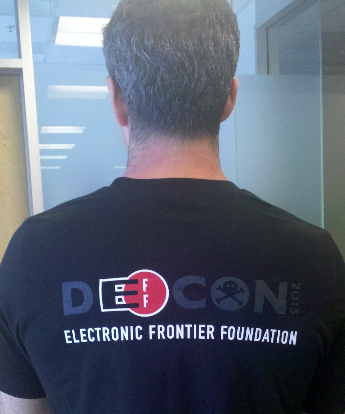 EFF's fourth annual DEF CON t-shirt is a killer. Special donors will be able to pick up the limited edition "Encryption is Key" design in Las Vegas this year, but that's not all. This t-shirt is a solveable puzzle. The first 10 individuals to decipher it, retrieve the correct passphrase, and reveal it to the staff at the EFF vendor booth will receive a special prize. 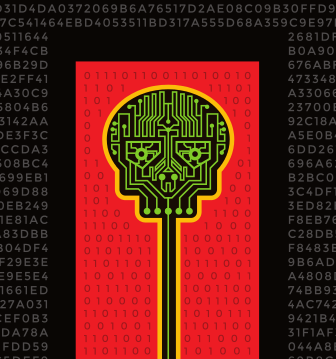 This t-shirt will not be available online unless some remain after DEF CON, but don't worry. There are some amazing things available right now. After donating at our booth in Las Vegas, be sure to catch EFF in action at talks for Black Hat USA, Security BSidesLV, and DEF CON! T-shirts and stickers are a small way of thanking the donors that allow EFF to fight for digital freedom. It also helps you start conversations about the issues that matter most in a rapidly-changing digital age. In a climate of rampant surveillance, strong encryption and robust security research matter more than ever. Thanks! EFF is a U.S. 501(c)(3) organization and donations are tax deductible to the full extent provided by law.